Trailblazing Working Musician Mamas Inspire Women That They Can Do it All! March is Women’s History Month and this year’s theme honors Trailblazing Women in Labor and Business. Its the month where we honor women and their accomplishments. Touring working mama musicians clearly fit the bill. These women combine their work, their families and their dreams together with determination, passion and motherly love. 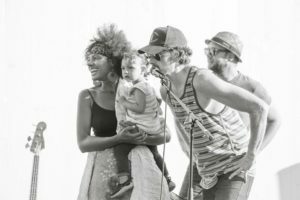 Rising to the challenges of motherhood and professional touring musicianship is a complex yet rewarding path. And, it’s no easy feat. 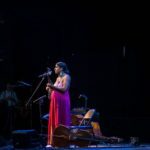 New Orleans-based Haitian-American Leyla McCalla and Chicago-based Allison Russell (Birds of Chicago) are two women musicians that are blazing the trail for the masses of working mothers and moms-to-be. Leyla is a Haitian-American who sings in French, Haitian, Creole and English. Leyla plays cello, tenor banjo and guitar. Deeply influenced by traditional Creole, Cajun and Haitian music, as well as by American jazz and folk, her music is at once earthy, elegant, soulful and witty. Allison (Alli) is a Vancouver native, a singer/songwriter, musician and producer and part of the husband and wife duo that make up the Roots band Birds of Chicago. Allison and Leyla took time out of their hectic schedules to chat with us and share how they manage it all. Here’s what they have to say. 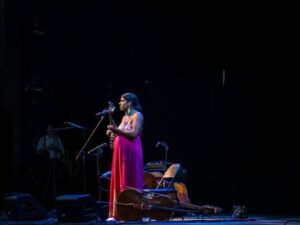 Interestingly, both women credit fellow female artist Rhiannon Giddens (Carolina Chocolate Drops / CMT’s Nashville) as inspiration. Leyla became pregnant with two and a half-year-old daughter Delilah early in her relationship with now husband Daniel. He has since joined the band. 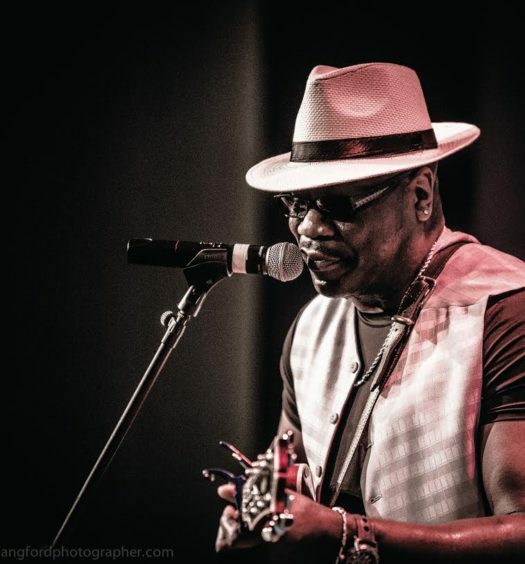 According to Leyla, “I was very clear that I intended to continue to tour and make music. 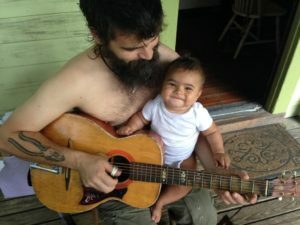 Dan had spent much of his life playing and touring in bands and for him, I think it was a dream that he didn’t even imagine could come true… until it did.” Leyla tours with her husband Dan Tremblay, their daughter Delilah and bandmate Free Feral (viola) plus a road nanny. 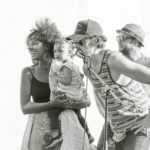 These moms make it very clear that their partners, communities, and especially their bandmates are an essential part of making it possible to do what they do. Despite the obvious challenges, both women are aware that their life on the road with their families is a privilege — a soul affirming choice for all involved. Factoring in their families, both women learned to tour smarter. Their bandmates are a big part of their families; they tour with nannies, and their children influence their focus on selfcare and time management. Daily stops at parks and museums are at the top of their lists. Alli: Ida makes us all laugh with her observations. She is confident, strong and outgoing. She adapts to new places and people with ease and has an open curiosity that delights me. I hope she’ll one day look back on her nomadic childhood with her musician parents as a positive and enriching experience. Leyla: Delilah gets to spend time with us in all these different contexts of our lives and I know that this is something she’ll carry for the rest of her life. She has gone from finding it challenging to be side stage while Mom and Dad are performing to understanding her role. I’d be going over the schedule for the evening with her; telling her that Mama and Papa are going to play the show after dinner and, if she wanted to watch she would have to be quiet. One time she cut me off and said, ‘I’m gonna’ be shhhh’. Alli: Her dad and I cherish having this time and these experiences together. Sure it can be exhausting and tough sometimes, but we wouldn’t have it any other way. Leyla: It is sometimes challenging. It’s been difficult to establish a routine for myself or my daughter. Every time I google something that I’m struggling with as a mom, the advice assumes that you are in the same place (locale) all the time. Yet, my work is so important to me. It’s critical that I share that with my daughter. 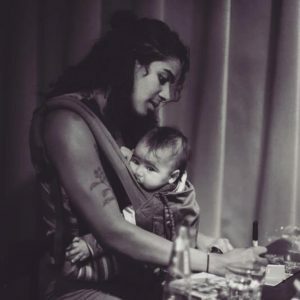 These two musician Mamas exemplify working mother trailblazers who have found an individualized wiki-type formula that works for each — enabling them to juggle career and family. Just as they both credit Rhiannon with influencing their decisions to become road warrior Mamas, Alli and Leyla are inspiring women and mothers across the globe with the message that they can have it all! 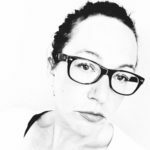 Shawna Cooper is a contributing writer for Socially Sparked News. The Canadian-based music industry professional is the owner of Dollartone Records, a management, consulting, label, booking & marketing company. A single mother of two, she has travelled with her children to Canada; US; India; Nepal; Thailand; Indonesia; Sri Lanka & Europe. Contributing to Socially Sparked is a new and exciting adventure. *photos provided by Allison Russell and Leyla McCalla. 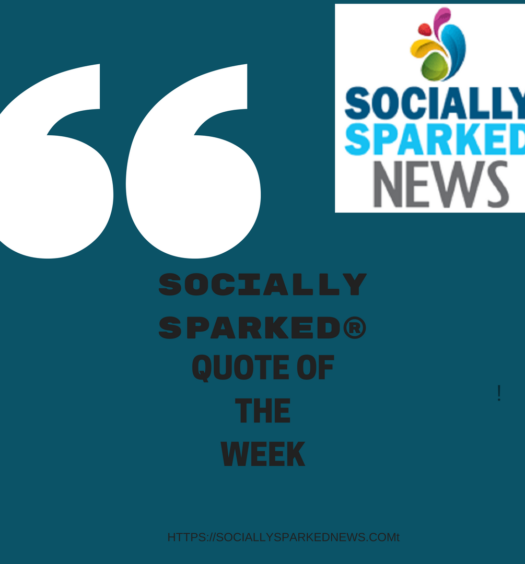 Shawna Cooper is a contributing writer for Socially Sparked News. The Canadian-based music industry professional is the owner of Dollartone Records, a full service management, consulting, label, booking & marketing company. A single mother of two, she has travelled widely with her children over the past 20+ years in Canada; US; India; Nepal; Thailand; Indonesia; Sri Lanka and Europe. Contributing to Socially Sparked is a new and exciting adventure. outstanding story. I can relate as I carried two babies on my hip, one at my knee, one in my belly to Ella Jenkins concerts in the 80s & 90s. Adult children now they are so grateful for the musical journey I took them on. My last concert before my daughter was born was drummer, Billy Preston. Not sure how related this is or maybe just meant to be, but Stefani became a drummer and an award winning drummer in the Rattan Trio at that!!! !